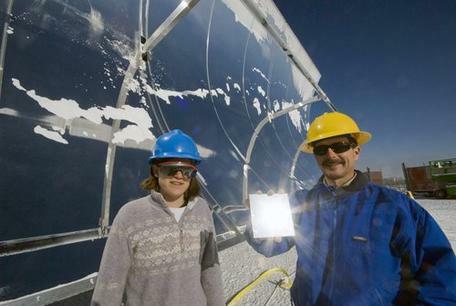 NREL senior engineer Keith Gawlik and University of Colorado graduate student Kathleen Stynes are conducting tests on the new SkyTrough parabolic trough design for a solar concentrator atop South Table Mountain. Gawlik is holding a sample of the trough's highly reflective metal skin which replaces heavy glass mirrors. Note: this workshop has already taken place. Read the workshop synthesis for a summary of key ideas and see the workshop outcomes for materials developed in association with the workshop. Workshop presentations and summaries of discussions are available on the program page; participants' activity, course, and essay contributions are available via the participants page. Engineering plays an important role in building a sustainable future, in areas such as hazard mitigation, and resource and energy use. Engineers and geoscientists already work together on such issues, and future engineers will benefit from a solid foundation in the geosciences. To address this need, this workshop is designed for undergraduate engineering and geoscience faculty interested in creating a stronger integration of engineering and geoscience for engineering students. The workshop will focus primarily on increasing the quality and quantity of geoscience in courses for undergraduate engineering students. Topics will include geohazards, water (hydrology and oceanography), environment (air quality, weather and climate), mining, energy (renewable and non-renewable), and sustainable engineering and societal impacts. The workshop will include a combination of plenary talks, panelist presentations, discussions and time for networking and collaboration. Workshop participants will share successful strategies and materials for integrating engineering and geoscience in their teaching and for highlighting sustainable approaches in engineering. A range of educational models will be examined, from individual to team teaching approaches, where content is provided by geoscientists, engineering geologists, and/or engineers. We welcome two-year and four-year college faculty, as well as faculty from research universities. An important outcome from this workshop will be to identify opportunities where new interdisciplinary curricular materials will have a major impact on integrating geosciences into the teaching of engineering. This workshop is open to 30 people (by application) and there is no registration fee to attend. Workshop stipends are available to help defray travel expenses in cases of financial need. Accepted participants are expected to contribute teaching materials to a new web-based collection devoted to the integration of geoscience and engineering. Read the workshop overview for details about the workshop goals, schedule, expectations for participants, and how to apply. Read the email list discussion, join the email list or unsubscribe using the Engineering, Sustainability, and the Geosciences email list. This workshop is part of the InTeGrate project for interdisciplinary teaching of geoscience for a sustainable future. InTeGrate is a 5-year, National Science Foundation (NSF) STEP Center grant, running from 2012 through 2016. This work is supported by a NSF collaboration between the Directorates for Education and Human Resources (EHR) and Geociences (GEO) under grant DUE - 1125331. Learn more about this project.